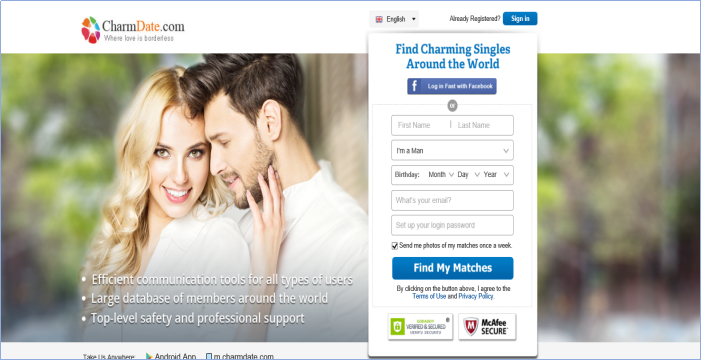 CharmDate is one of the most popular online communication platforms worldwide. It has helped many people look for romantic opportunities across the world. If you are interested in joining as a member there, we strongly suggested you read the full investigation on CharmDate.com below. Perhaps CharmDate.com’s fast and easy registration process is to attract members – just three things and a form asking you to fill in your casual details. Just a few easy steps and you’re all ready to step onto the site. You can search according to age, location, education, profession, height, weight, religion and even marital status. Does CharmDate.com aim to scam you? The ladies on CharmDate.com all look beautiful, hot, attractive, enough to catch one’s eyes. They boast that they have a strict audit system – only those who have met the stringent requirements of CharmDate.com can have their profiles posted on CharmDate.com. But how can we confirm that the ladies are real only by looking at their photos? After all, we cannot see the ladies in person to check. Speaking of this, I would like to show you how to use CharmDate.com and how to check if a woman is real. Firstly, after registering as a CharmDate.com member, you can receive Admirer Mail from ladies, as well as chat invitations. As there are so many admirers, how do you pick one who is real? My method is very simple, have a look at her Video Show. A Video Show is generally around 3 minutes, and most of them show ladies’ everyday lives. Although this is a paid service, the price is acceptable. We can compare the Video Show and photos from their profiles to check whether they look the same, whether it’s the same person. As long as you’ve seen the lady’s video, we no longer have to worry about her authenticity. We’ve now confirmed the lady is real, but how do we know if the lady sitting at the computer is the one in the photos? If you’re still worried, using CamShare is a good choice as this is a real-time two-way video chat service. As you can see and interact with her in real time, not only can you be certain whether or not she’s real, you can also enjoy this fun way of communicating. This is probably why this service is so expensive, but if you think about it, it’s worth it. And not every dating site provides this service. CharmDate.com also offers Live Chat and EMF mail service, where you can also pay to view short videos lasting aroud 8-15 seconds from ladies. It’s not cheap, but to be able to watch exclusive videos of ladies that only you can see can be considered a privilege. I’m going to leave it to you. As always, the choice is yours, but make sure you take everything I’ve mentioned into consideration. And gosh darn it, you have! Look at those comments… I’m always shocked on how much folks get heated up about this site. Here is the experience of using Charmdate.com.And from this video you will learn the truth that:Charmdate.com is not a scam.Enjoy it. Joining this platform was a test for me, It’s my first time ever on a dating site, I got to meet ladies from different parts of the world. Thanks to Charmdate, I had my first Interracial relationship and it’s perfect. It’s been two months since I joined this site. I have been chatting with several girls, but it’s this one cute girl who has really caught my attention. We have developed a connection and I’m hoping that we’ll both find something special in each other. Time will tell. Plenty of pretty girls here and after chatting with several girls I found they are really cool! Definitely worth trying, you got nothing to lose.